Eric has been working with the Veterans Administration, the Small Business Administration, SCORE Mentors, New York State, and other government agencies to become fully certified as a Service Disabled Veteran Owned Small Business and other Socio-economic programs offered to Small Businesses in the United States. Government Contracting opens the several doors to new growth opportunities for us. Government contracts can guarantee ongoing revenue. A stable cash flow enables us to increase our marketing budgets, hire employees and grow our business intelligently. Reoccurring monthly business generated from government contracts can also hedge against months that are slow. In fact, many contracts have 3–5 consecutive year contract terms. - System for Award Management (SAM) — All Government Contractors must be registered with SAM. SAM claims to process applications within 7–10 business days, however since a recent data breech in March 2018, SAM now requires an extra verification step and a submission of a notarized letter for each entity member. For Colorful Dots, LLC our process took 28 business days to become “Active”. - Dun & Bradstreet — All Government Contractors must obtain a DUNS Number. This number will be needed for nearly every application going forward, so make sure you write it down somewhere safe. Basically, a DUNS number is a credit score for your business. If you’re a government affiliate such as a Veteran, D&B will expedite your DUNS number for free. You can also pay for this to be expedited if you do not qualify as a Veteran. For Colorful Dots, LLC, our DUNS number took approximately one week. - Commercial and Government Entity code (CAGE CODE) — A CAGE code will also be required to conduct business with any Government agency. The Commercial and Government Entity Code, or CAGE Code, is a unique identifier assigned to suppliers to various government or defense agencies, as well as to government agencies themselves and various organizations. CAGE codes provide a standardized method of identifying a given facility at a specific location. Thankfully, once you register with SAM, you will most likely receive a CAGE code for free based upon the information you provided about your company. - Standard Industrial Classification (SIC) — The Standard Industrial Classification (SIC) is a system for classifying industries by a four-digit code. Established in the United States in 1937, it is used by government agencies to classify industry areas. The SIC system is also used by agencies in other countries, e.g., by the United Kingdom’s Companies House. - North American Industry Classification System (NAICS) — The North American Industry Classification System (NAICS) is the standard used by Federal statistical agencies in classifying business establishments for the purpose of collecting, analyzing, and publishing statistical data related to the U.S. business economy. Thankfully, during SAM registration you will assign your NAICS Codes which will be used for nearly every application you apply for thereafter. Choose your NAICS codes wisely, as there are some restrictions that apply when being considered as a “small business” from the SBA. - Capability Statement: A “cap statement” is a one sheet of information about your company and the services or products it offers. It can be used to send to procurement officers to suggest your company to assist with awarded contracts or available contracts. You’ll want to include your Capabilities Narrative: Basically an “about us” section that pitches what your company does and highlight anything that could stand out to the procurement officer. You’ll also want to include your Capabilities Keywords: A list of keywords that help identify your products or services. If you’re a Veteran, Woman, Minority, Disabled, or perhaps a Discriminated Person and are at least 51% owner of your company, you may also qualify for other “set-asides” for Socio-economic programs which are mandated to be awarded to these companies by the Federal and State Governments. Each program is different and each program has different steps to take towards certification. For instance, Colorful Dots, LLC has applied for SDVOSB (Service Disabled Veteran Owned Small Business) in both Federal Government and New York State. Both applications are required to win SDVOSB set-aside contracts, and both programs require certification. You can self-certify by checking a check box in SAM registration, however if you want to win more contracts, I’d highly recommend you become certified through each agency accordingly. Basically, the more “set-asides” or Socio-economic programs a company can leverage, the greater your chances of being able to bid on a larger percentage of available government contracts. Remember, the Federal Government has the highest spending budget compared to any private spending budgets. It’s a big deal, and one contract could potentially be all that your company needs in terms of growth and revenue for it’s entire existence. There are often a ton of widely used Government acronyms and it can be extremely overwhelming in the beginning to try and comprehend them all. We’ve put together a full list of over 500 Government Acronyms to help you understand what each acronym means. Check out our Government Contracting Acronyms list here. 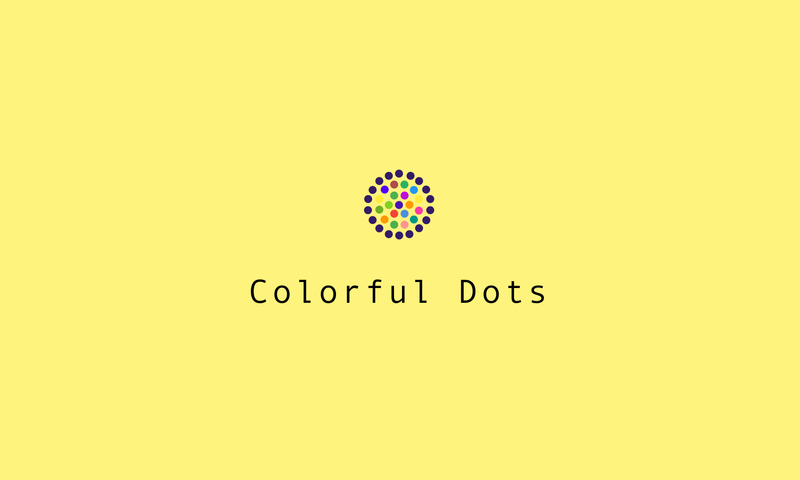 What’s Next for Colorful Dots, LLC? 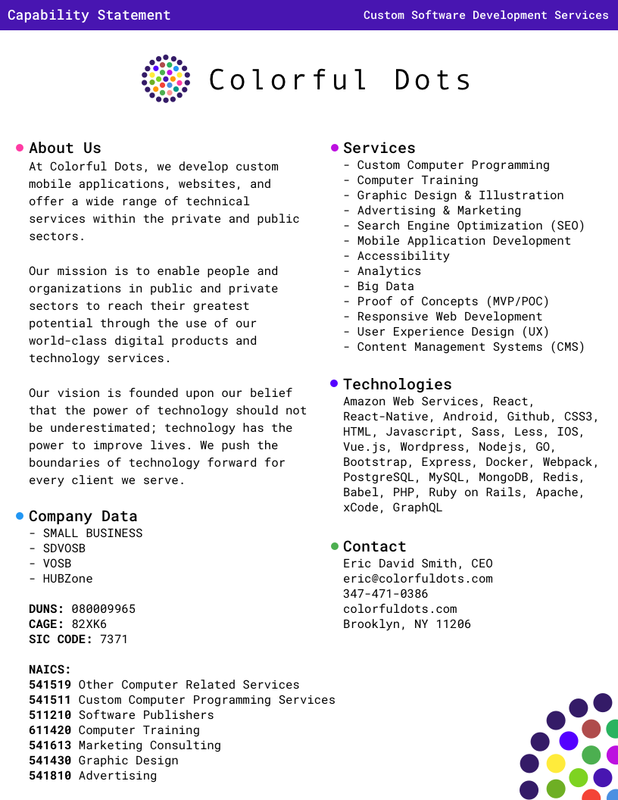 Colorful Dots, LLC is still in pending status for several applications and certifications. We have taken approximately 558 hours (roughly two months every day for 9 hours) to apply for certifications, applications, diversity programs, meetings with SBA, SCORE, phone calls, and to setup our business properly to be able to work within the Federal and Local Government Agencies. This process has been long and extremely intense, however we feel it is an advantage that we will have over some of our competition in the software development industry. We’re proud to be working closely with our advisors, mentors, and other organizations to ensure we’re on the right path towards success with our company. If you are considering working with us, please feel free to reach out. We’re located in Brooklyn, NY and are available to discuss your project at any time. We encourage you and your company to complete our free proposal form to kick off our initial consultation.